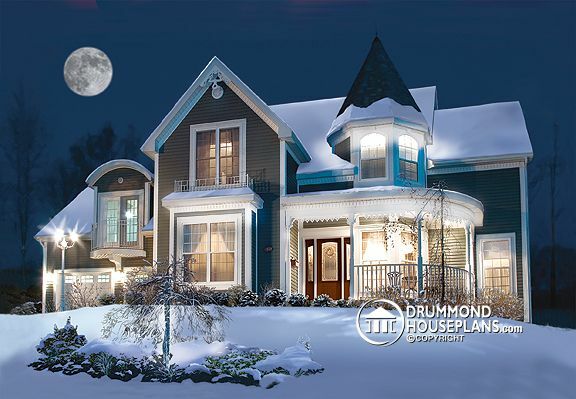 If you are passionate about Victorian architecture plan 3814 is a beautiful example of Victorian inspiration that will be a pleasure to discover. Outside, the turret is surrounded by a porch with turned posts and detailed work of the angle brackets and moldings that continues from beneath the eaves to enhance the Victorian feel of the entrance and carry the motif throughout. The large entrance foyer opens onto a hall with a second family room to the left that would make a superb home office. The hall ends in an exquisite living area with a separate dining room on the front side of the well appointed kitchen that boasts a walk-in pantry, and a well fenestrated breakfast nook towards the back. The comfortable family room faces the back of the house and its beautiful fireplace is nestled between the large windows. Upstairs, the two secondary bedrooms share a full bathroom and the laundry room on this level is sure to be a practical addition. The master suite has a full bathroom with toilet enclosure, separate shower and a double vanity along with a pedestal bath, romantically placed within the turret. The walk-in master bedroom closet and the large, 473 sq.ft. of bonus space above the garage are two more delightful surprises that this model has to offer.